October 20, 2015: I am at the new Surrey City Hall, seated inside the City Council chambers. Far ahead, on a raised platform, the mayor and her council members. Her Worship will soon announce the first poet laureate for the City of Surrey: and yes, that would me! And on that crisp October night, I’m glad to be accompanied by several dear Surrey friends and poets, students I’ve taught at the Simon Fraser University Southbank Writers Program, and many of the library and community representatives who’ve worked long and hard to create this position, including League poet Heidi Greco. What will it mean to be a Poet Laureate? The week our country holds a federal election resulting in a new Prime Minister-elect, the local Surrey paper features news of my appointment on the front page. Friends send me photographs and notes. Pretty cool, right? There’s an openness here in this large suburban city on the edge of Vancouver: everywhere I visit, on my “listening tour” of arts and literary organizations, people ask me follow up questions, when I hand out my lovely new Laureate cards, announcing writing consults on the second Friday of each month (I’m already booked ’til February 2016): what exactly does a Laureate do? What does that word mean? At my first gig, a sold-out series of blue pencil café style writing consults at the Surrey International Writers Conference, writers who excel at speculative and non-fiction, novel writing, bring me their poetry. Rewarding and intense, we discuss image and rhythm. I share a few ideas: about community, about Surrey stories, inter-cultural and multi-lingual, through poetry. These past few weeks, I’m mainly listening: to the many arts and literary organizations and city representatives and staff who’ve worked together to help create this new laureate position, to the students who bring me their work, to the poets who work and practice in this rapidly growing city. 12,000 newcomers every month, seven neighbourhoods, the largest school district in British Columbia. 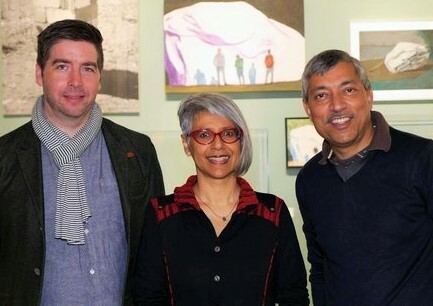 Renee Saklikar at the Surrey Art Gallery with Jordan Strom and Kamal Sharma. My official task will be to serve as a “kind of ambassador for the City of Surrey while advocating for literacy and the literary arts”, and my passion is to imbue that role with a poet’s obsession: place, language, longing; how to connect youth to seniors, settled communities and cultures to new arrivals. Might poetry find connections in this city of contrasts—farming land, vast tracts of green, fens and the Fraser river juxtaposed against high rises, housing developments, beautiful new architecture (Surrey City Centre Library, my “office hours” base), rambling shacks and San Francisco style bungalows, sophisticated cultural offerings (the Surrey Art Centre is spectacular), stunning South Surrey vistas of ocean and mountains, and yes, long lines of strip malls, of highways. Might poetry find connections in every twist and turn of this city, where I sense—emanating—a call: come find us! Next week, to celebrate the 40th anniversary of the Surrey Art Gallery, I’ll be part of “Voicing the City In/verse: reading Surrey and the Super Suburb,” with over 15 poets, novelists and spoken word artists. The two-day event includes a literary cabaret at a North Surrey pizzeria and a symposium at the Gallery, with keynote speaker M.G. Vassanji. I can’t wait and will write to you again about this incredible journey. Till then, I remain, and faithfully, writing a life-long poem-chronicle, thecanadaproject. 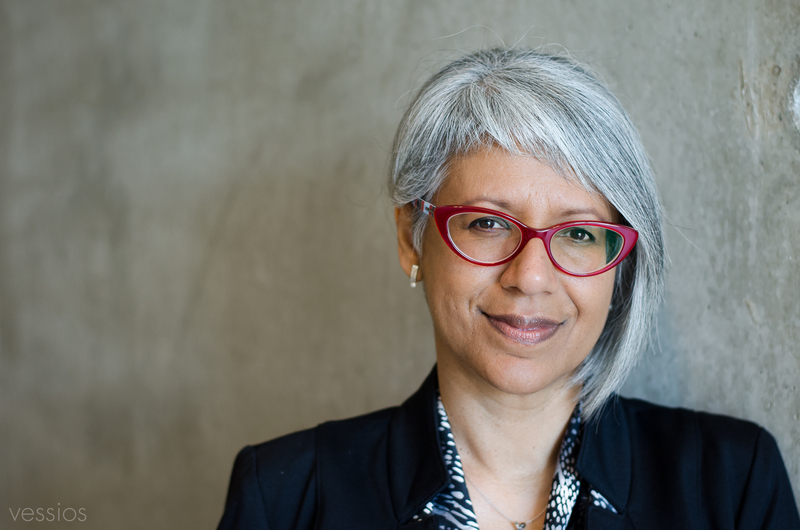 Renée Sarojini Saklikar writes thecanadaproject, a life-long poem chronicle that includes poetry, fiction, and essays. Work from the project is widely published in journals, anthologies and chapbooks. 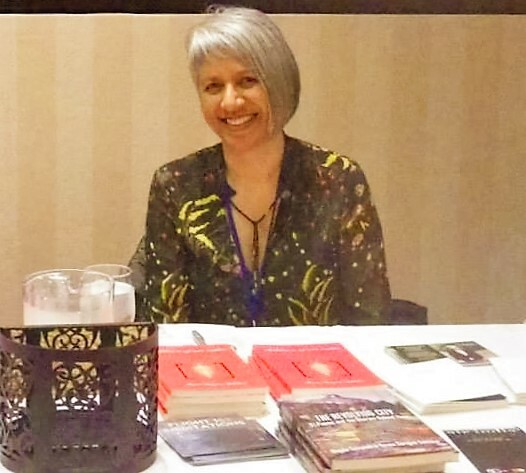 The first completed book from thecanadaproject is children of air india, un/authorized exhibits and interjections, (Nightwood Editions, 2013) winner of the 2014 Canadian Authors Association Award for poetry and a finalist for the 2014 Dorothy Livesay Poetry Award. Trained as a lawyer at the University of British Columbia, with a degree in English Literature, Renée was called to the British Columbia Bar in 1991. A graduate of The Writer’s Studio at Simon Fraser University, Renée is currently a mentor and instructor for the university and co-founder of a new poetry reading series, Lunch Poems at SFU. In September 2015, with acclaimed author Wayde Compton, Renée co-edited The Revolving City: 51 Poems and the Stories Behind Them (Anvil Press/SFU Public Square). Renée serves as an advocate on the national council of The Writer’s Union of Canada and is at work on the second volume of thecanadaproject, excerpts of which can be found in the journals Eleven Eleven, The Capilano Review and online at DUSIE and The Rusty Toque. Renée is working on a sequence of bee poems based on her collaboration with well-known biologist, Dr. Mark Winston. On October 20, 2015, Renée was appointed Poet Laureate for the City of Surrey. She is a member of the League of Canadian Poets.